5 Publications by "Y. Zhao"
Novel statistical modeling and training techniques are proposed for improving classification accuracy of land cover data acquired by LandSat Thermatic Mapper (TM). The proposed modeling techniques consist of joint modeling of spectral feature distributions among neighboring pixels and partial modeling of spectral correlations across TM sensor bands with a set of semi-tied covariance matrices in Gaussian mixture densities (GMD). The GMD parameters and semi-tied transformation matrices are first estimated by an iterative maximum likelihood estimation algorithm of Expectation- Maximization, and the parameters are next tuned by a minimum classification error training algorithm to enhance the discriminative power of the statistical classifiers. 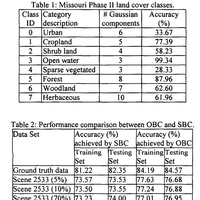 Compared with a previously proposed single-pixel based Gaussian mixture density classifier, the proposed techniques significantly improved the overall classification accuracy on eight land cover classes from imagery data of Missouri state. Y. Zhao, X. Zhou, K. Palaniappan, and X. Zhuang. Statistical modeling for improved land cover classification. SPIE Battlespace Digitization and Network-Centric Warfare II, volume 4741, pages 296--304, 2002. The development of automatic land cover classification maps using validated statewide datasets supported by state and federal agencies are becoming an important tool for monitoring change, planning, and land use impact assessment. Accurate and fast classification algorithms, adaptive to different data sources and scales, will facilitate cost effective routine updating of land cover maps using current satellite imagery to monitor and detect a broad array of land cover phenomena. 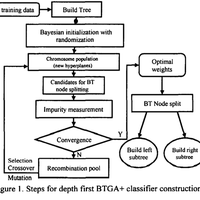 A new binary decision tree classifier incorporating an evolutionary genetic learning algorithm is proposed for land cover classification. The new classifier referred to as the Enhanced Binary Tree Genetic Algorithm (BTGA+) has been applied to automatically classify tens of millions of pixels in two full scenes of Landsat TM data using multispectral multitemporal radiance features. The BTGA+ classifier can assign pixels into eight land cover categories for Landsat TM scenes in central Missouri with nearly 90% classification accuracy. K. Palaniappan, F. Zhu, X. Zhuang, Y. Zhao, and A. Blanchard. Enhanced binary tree genetic algorithm for automatic land cover classification. IEEE Int. Geoscience and Remote Sensing Symposium (IGARSS), volume II, pages 688--692, 2000. An optimal Bayesian classifier using mixture distribution class models with joint learning of loss and prior probability functions is proposed for automatic land cover classification. The probability distribution for each land cover class is more realistically modeled as a population of Gaussian mixture densities. A novel two-stage learning algorithm is proposed to learn the Gaussian mixture model parameters for each land cover class and the optimal Bayesian classifier that minimizes the loss due to misclassification. In the first stage, the Gaussian mixture model parameters for a given land cover class is learned using the Expectation-Maximization algorithm. The Minimum Description Length principle is used to automatically determine the number of Gaussian components required in the mixture model without overfitting. In the second stage, the loss hnctions and the a priori probabilities are jointly learned using a multiclass perceptron algorithm. Preliminary results indicate that modeling the multispectral, multitemporal remotely sensed radiance data for land cover using a Gaussian mixture model is superior to using unimodal Gaussian distributions. Higher classification accuracies for eight typical land cover categories over one full Landsat scene in central Missouri are demonstrated. F. Zhu, Y. Zhao, K. Palaniappan, X. Zhou, and X. Zhuang. Optimal Bayesian classifier for land cover classification using Landsat TM data. IEEE Int. Geoscience and Remote Sensing Symposium (IGARSS), volume I, pages 447--450, 2000. Gaussian mixture density modeling and decompo- sition is a classic yet challenging research topic. We present a new approach to the modeling and decomposition of Gauss- ian mixtures by using robust statistical methods. The mixture distribution is viewed as a (severely) contaminated Gaussian density. Using this model and the model-fitting (MF) estimator, we propose a recursive algorithm called the Gaussian mixture density decomposition (GMDD) algorithm for successively iden- tifying each Gaussian component in the mixture. The proposed decomposition scheme has several distinct advantages that are desirable but lacking in most existing techniques. 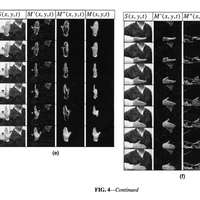 In the GMDD algorithm the number of componentsdoes not need to be specified U priori, the proportion of noisy data in the mixture can be large, the parameter estimation of each component is virtually initial independent, and the variability in the shape and size of the component densities in the mixture is taken into account. 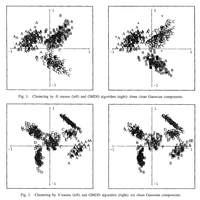 Gaussian mixture density modeling and decomposition has been widely applied in a variety of disciplinesthat require signal or waveform characterization for classification and recognition, including remote sensing, target identification,spectroscopy,elec- trocardiography, speech recognition, or scene segmentation. We apply the proposed GMDD algorithm to the identification and extraction of clusters, and the estimation of unknown probability densities. Probability density estimation by identifying a decom- position using the GMDD algorithm, that is, a superposition of normal distributions, is successfully applied to the difficult biomedical problem of automated cell classification. Computer experiments using both real data and simulated data demonstrate the validity and power of the GMDD algorithm for various models and different noise assumptions. X. Zhuang, Y. Huang, K. Palaniappan, and Y. Zhao. 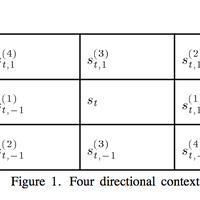 Gaussian mixture density modeling, decomposition and applications. IEEE Trans. Image Processing, volume 5, issue 9, pages 1293--1302, 1996.